I can’t take credit for this cute design…a good friend of mine came up with it! I love it…don’t you? Wish I had those sandals on right now and I was at the beach! Most of the supplies are from Stampin UP and the sentiment is from Hero Arts. 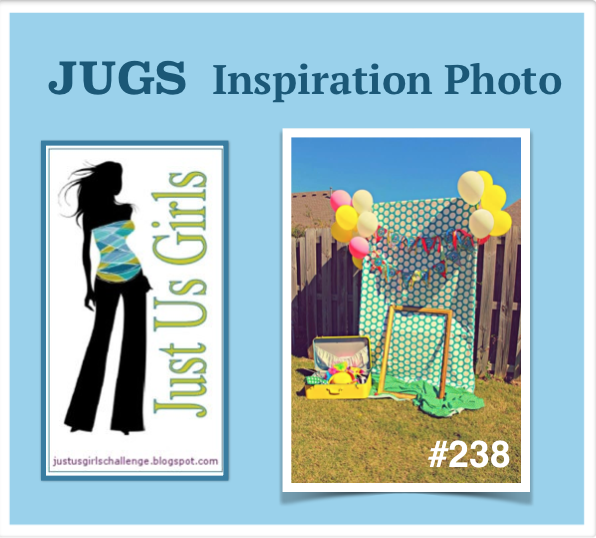 Come on over to Just Us Girls and see what the talented teammates of mine did with this Inspiration Photo! We all interpreted it quite differently! Love that! This is our last challenge with our guest designer Lee-Anne over at JUGS! You have been wonderful to work with Lee-Anne! You are very talented! Thanks so much! Categories: Cards | Tags: Card making, Cards, Happy Birthday, Inspiration, rubber stamps | Permalink. Super card, Nanc! Flip flops are sure a fashion statement these days, aren’t they? And, yours are great! Love your card! Nancy, I love those darling flip flops! Such a fun card…just makes me smile! It doesn’t matter who came up with the idea…this is a very cool card! Love those flip flops and the fun colors! Love it! What a fun, summery card! Love those flip flops and that striped background…..great job! I just love your card Nancy. The flip flops are adorable and I love the flowers too. Have a great weekend my friend. Those flip flops are so cute. I don’t wear them but sandal weather would suit me fine. Ahhhhhhhhh, now I could really sink my toes into those! Cute! Your card is so fun! I love those flip flops and really can’t wait for the weather to warm up to flip flop temps up here. Those flip flops are the bomb!! fun take on the challenge!! Yeah! Fabulous green flip flops!! Love it! The paper you used for the flip flops is GENIUS! Looks like rubber soles! Fun card! Let’s go to the beach!